Prosecutors and a local TV station identified Jeffrey Winder as the man who threw a punch at Jason Kessler, organizer of the 2017 "Unite the Right" rally in Charlottesville, Va.
For the crime of striking "Unite the Right" organizer Jason Kessler, a Charlottesville, Va., jury says Jeffrey Winder must pay a fine of $1 — far short of the maximum possible penalty. Winder had appealed his original guilty finding, which included a 30-day jail sentence. A judge had found Winder guilty of misdemeanor assault in February. After Winder appealed, a jury affirmed the guilty verdict this week but decided he should serve no jail time — and pay only a minimal fine. "They clearly thought about it very sincerely," Winder's attorney, James Abrenio, said of the jury. He also praised the judge and prosecutor in the case, saying, "They were all kind." Winder had faced a maximum sentence of a year in jail and a $2,500 fine. The assault took place on Aug. 13, 2017, one day after Heather Heyer, 32, was killed by an alleged white supremacist who drove his car into a crowd of people who had taken to the streets in Charlottesville to oppose the white nationalist rally. With Charlottesville in an uproar over both the rally and the deadly attack, people opposing Kessler's views shouted him down as he attempted to give a news conference. Protesters eventually closed in on Kessler as he tried to speak, booing, shouting and forcing him away from a bank of microphones. As Kessler tried to duck away from the chaotic scene, a man threw a looping punch that seemed to connect with Kessler's head and shoulders. Prosecutors said that man was Winder — who has denied assaulting Kessler but who was also immediately identified in a local NBC29 TV news report as "the man who punched Kessler in the face." Winder told NBC29 (WVIR), "He [Kessler] had an incredible amount of nerve coming in front of the people of Charlottesville after the pain, suffering, and terror that he brought on the community. He should never be allowed to show his face in town again." Kessler, who was called as a witness at Winder's trial, testified that the incident hadn't injured him physically but had taken an emotional toll. "I was attacked in front of the whole world, and then people made fun of me for it," he said, according to The Daily Progress in Charlottesville. Winder's attorney, James Abrenio — who noted via Twitter that he has worked on the case pro bono — said in court and after the trial that Kessler had approached the news conference in a way that showed a lack of sensitivity and an intent to "make profit off tragedy." It's possible Winder could file another appeal, taking his case to a higher state court. "We still have an avenue" to challenge the guilty finding, Abrenio said, adding that in his view, Virginia's assault and battery laws are not very well-developed. Abrenio said he will discuss a potential appeal with Winder. 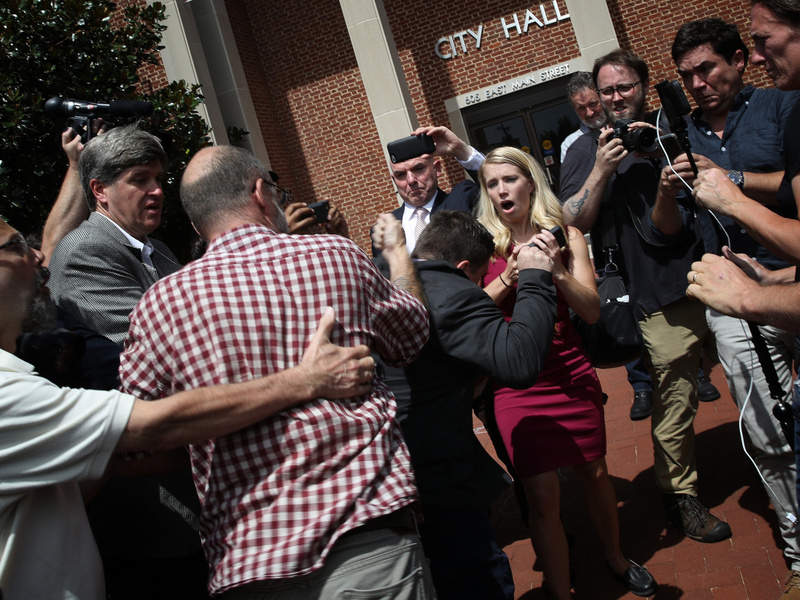 Winder is among several people who have been accused of committing assault or other crimes against Kessler around the time of the Charlottesville rally. Of them, Winder had faced the most serious consequences, with other cases having been resolved through either suspended penalties or community service.